“There. That should solve things.” I’m pretty sure those were the first words to form in the mind of 62-year old John Parsley immediately after he rammed his 2006 GMC Sierra into the lobby of a Comfort Inn in Alva, Oklahoma. No one was injured, and I’m sure this thoughtful act of problem-solving took care of everything. The guy even had a dealer-installed lobby-ramming bar on the front of his truck! You have to admire a person using the right tool for the job. Parsley, of Gonzales, Texas, took issue with two charges on his bill that were declined on his credit card, prompting Parsley to pay in cash. The charges seemed to have shown up on Parsley’s card, for which he demanded a refund. The hotel manager suggested that Parsley would need to contact his credit card company about the conflicting charges. But why call when you can ram? See? They thought he was bluffing. 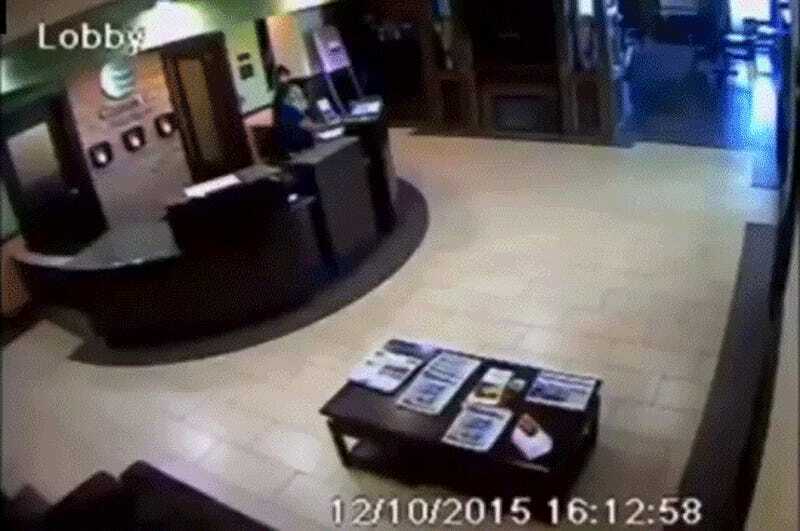 The man’s hands were tied — he pretty much had to drive into that lobby. He now faces several criminal charges. Oh, Mr. Parsley. You hot-headed, grumpy old idiot.